TonerGreen Lowers the Price of HP 647A/648A Toner Cartridges | TonerGreen - Eco-Friendly Toners from the U.S.
TonerGreen announced to lower the price of their their Eco-Friendly HP 647A/648A toner cartridges: HP CE260A black toner, HP CE261A cyan toner, HP CE262A yellow toner and HP CE263A magenta toner to $240. Our HP CE260A ($73.99), CE261A ($73.99), CE262A ($73.99), CE263A ($73.99) Toner Cartridge Set is Eco-Friendly! Remanufactured with up to 75% recycled components, our HP CE260A, CE261A, CE262A, CE263A Set A Toner Cartridge Set is thoroughly engineered to meet or exceed OEM specifications. All our ink and toner cartridges are backed by 100% Risk-Free Guarantee. Our Toner Cartridge Sets are 100% Made in the US. Our factory is supervised by engineers and experienced technicians who are on-hand to monitor the effectiveness of the remanufacturing process. 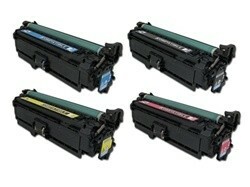 Furthermore, each TonerGreen Toner Cartridge Set is tested for output quality.